Bharat Matrimony provides matchmaking services for people who are interested in dating or marriage. It has millions of members, primarily from India but from around the world, and has found a great deal of success in helping members to find their ideal partner. There are several packages to choose from, depending on your budget and requirements. These range from the free account, which really only allows you to explore the site, to a paid account which provides a number of communication tools. At the very high end, you can pay for a personalized matchmaking service which will pay a specialist to help you find a partner. Profiles contain a lot of information, plus multiple photos if you choose. This gives you a good understanding of a person before you contact them, and you can also refine your searches to take your personal preferences into account. If you’d prefer, you can simply sit back and wait for the automatic matches to roll in, then explore the recommended profiles and decide whether or not to contact members. We like the fact that this site takes you to region-specific pages to find dates. These pages are tailored to your particular area, so you can find local information and seek out members who live nearby. This is of less use to members outside of India, but it’s still interesting to explore where other members are from. There are several communication tools, including email, instant messaging and the potential to record voice messages. There are, however, no webcam options, which is a little disappointing. Other features are also slightly lacking, and whilst the site is very professional, it might lack a little bit of fun for some members. There are no community features such as a forum, so chatting is restricted to 1 on 1 communication. Members are required to verify their authenticity by including their mobile number when they sign up. You will then be sent a code which will verify your account. This is to help stop fake accounts being created, therefore reducing the likelihood of fraudulent accounts. Still, there are a lot of members using this site, and it’s hard to be sure that they’re all genuine, but at least Bharat Matrimonial takes such problems seriously. BharatMatrimony isn’t cheap, and its 1 on 1 support service (where a member of the team does all the hard work for you) will incur a fairly considerable cost. Still, if you have the money for the personalized matching service and don’t have the time to use the site, or you’re looking for a very special person which you might not have the skills to locate, then the personalized service might be of use to you. 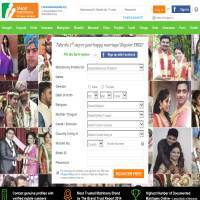 Bharat Matrimony offers its members a large catalog of genuine members who are looking for life partners. Its regionalized pages add a little local flavour whilst helping you to home in on people who live nearby. Whilst it doesn’t have everything for everyone, the sheer number of members, combined with useful communication tools, make it unsurprising that it’s achieved so much success to date.